Therapedic mattresses of the innerspring variety are made using state of the art technology that allows them to offer solid support, comfort and durability. These features have made them appreciated by many users who time and again have chosen them over others. By offering a good night's sleep, these mattresses help to keep the body healthy. They are also durable, which means that once you acquire one of them you'll enjoy a good night's sleep for a long time. The mattress is made of quality materials which enable it to adequately support the body when sleeping, thereby providing ample comfort at night. The Therapedic Back Sense line has advanced features that are designed to offer excellent back support and increase spinal comfort when sleeping. The main thing that sets the Back Sense line apart from other brands focused on back care is their Hourglass polypropylene insert provided in the top layer. It is meant to provide extra reinforcing support at the all important shoulder, hip and lower back regions. These Therapedic mattresses come with an improved support grid that makes them stronger in the most crucial areas. Their open spring coils give progressive firmness under pressure thereby improving body support. This allows the body to lie in a neutral position which maximizes your rest and recovery. The mattress also comes with zoned coil configuration which varies the density of coils across the surface offering changing support for different parts of the body. Because of this they're able to provide balanced support for the whole body. Brighton comes with the exclusive Verticoil innersprings and hourglass shaped back support. It has polyurethane insulation foam, and its pillow-top cover is quilted to 1 inch of polyurethane foam. It also has a high profile foundation and comes with a 5 year warranty. They come in several sets: twin, full, queen, and king and the prices range from $399-$700. 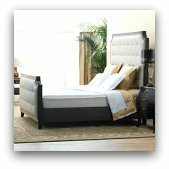 The main difference with the Oxford is that its pillow-top cover is quilted to 1.5 inches of super soft quilt foam and polyurethane foam while Brighton's is quilted to 1-inch. It also comes in the same sets, and its prices range from $499-$899. These Therapedic mattresses have the pillow-top cover quilted to 1.875 inches of super soft quilt foam and high density quilt foam. There is also a foam edge encasement and a 10 year warranty. It comes in the same range of sets, with prices from $519-$999. For this model, the pillow-top cover is quilted to 2 inches of super soft quilt foam and convoluted quilt foam. The same range of sets: twin, full, queen and king are offered but prices range from $699-$1199. Covington has a 1.5 inch firm foam base. Its pillow-top cover is quilted to 1.75 inches of high density quilt foam. It also has a foam edge encasement, and its price for the same range of sets is $799-$1299. Finally - the Manchester foam base is 1.5 inches thick and its pillow-top is quilted to 2 inches. Its price ranges from $849-$1399. Therapedic Innergy mattresses feature an exclusive coil design that does not lean under motion, doing away with sleep disturbing motion transfer. These Therapedic mattresses also have extra layers for comfort which are made with latex, visco elastic or convoluted polyurethane foam to relieve pressure. Their TheraFoam encasement improves stability by eliminating border breakdown and roll together. Duke Plush has an exclusive alternating coil design and a foam-encased coil unit. It also has cotton pad insulation and its cover is quilted to 2-inches of soft TheraFoam and Dacron. It includes a matching steel grid foundation and a 10 year non-prorated warranty. It comes in twin, full, queen and king sets whose prices range from $1300-$2000. 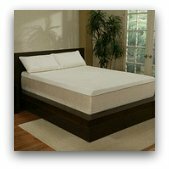 This mattress has polyurethane insulation foam and its cover is quilted to 2.25 inches of soft TheraFoam and Dacron. Its price ranges from $1470-$2120. These extra firm Therapedic mattresses are quilted to 1.625 inches of firm foam. They have a matching steel grid foundation and a 10-year non-prorated warranty. The prices range from $1470-$2120. The main difference with this type is that its pillow-top cover is quilted to 3 inches of soft TheraFoam and Dacron. It also has a 10-year non-prorated warranty and its price range is $1550-$2250. The basic difference with the Coronet Pillow-Top is that its cover is quilted with pure latex foam rubber but the size is the same. Prices range from $1640-$2640. Last but not least, in this case the pillow-top cover is quilted to 2 inches of slow recovery visco foam and 1.5 inches of pure latex foam rubber. The price range is $1740-$2770.